I'm guessing all choices lead to ports of old PC games. I don't get the hate for ports I really don't. Do you guys realize for a publisher it is a hell of a lot easier to have games ported than to make all new ones from scratch? If you hate it do something about it and make a game and contact the guy to publish it. Otherwise be happy we get new games at all. Josh Prod does not DEVELOP games, he financially contacts developers who could port their games. Expecting him to find new people that can create all new exclusive experiences is pretty unrealistic lol. I have worked on 3 gaming projects before, they were total conversion mods, and those took up a lot of time just to do. Developing a new game from scratch is totally more difficult. You can't twist people's arms to make a game for you. I feel there a ton of misconceptions about what it is this guy does. As said before, if there aren't companies out there already making games not much we can do about that now can we? My suggestion is to get him in contact with Phenom and have him fund the guy to get In the Line of Fire finished, as well as the Hypertension devs. Otherwise we are going to continue to keep seeing ports from mobile, PSP or PC. So much good stuff in development that was exclusive that never got funding and just fizzled out and vanished. I feel the Dreamcast community could do a HELL of a lot more to point Josh Prod in the correct direction of faltering exclusive products if they feel so strongly about ports lol. Thx Anthony for telling this guy off. He spews too much hate on a very good publisher that bring very interesting already commercial products even if they from mobile or yesteryear. Heck he brought 2 3d games when all have failed and I guess for some that still isn't enough for some. Now on the poll I chose 3d Adventure game. I would love for him to considering dreams to reality from PC , one could dream. Maybe an different PC game like I of the dragon. If you've read any of my past arguments, which it sounds like you either haven't or don't remember them, my issue is not the games per se, but the price. 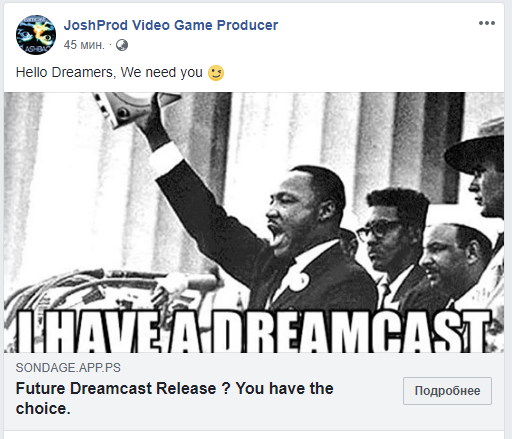 And due to that, it feels like more of an exploitation of nostalgia and of Dreamcast lovers on the part of JoshProd than anything else. DCGX wrote: If you've read any of my past arguments, which it sounds like you either haven't or don't remember them, my issue is not the games per se, but the price. And due to that, it feels like more of an exploitation of nostalgia and of Dreamcast lovers on the part of JoshProd than anything else. Best idea I've read in a very long time! My I idea was "online game" but Krssn's idea is more realistic. I am NOT on facebook so I cannot vote. DC-Talk is my only virtual home. Anthony817 wrote: I don't get the hate for PORTS I really don't. Anthony817 wrote: Otherwise be happy we get NEW games at all.